Day 1 March 28, 2011: Part of any fibre enthusiast’s hobby is an appreciation of yarn. Choose two yarns that you have either used, are in your stash or which you yearn after and capture what it is you love or loathe about them. If you’ve been reading here for a while or even a short time you probably have noticed I have a bit of a sock habit. 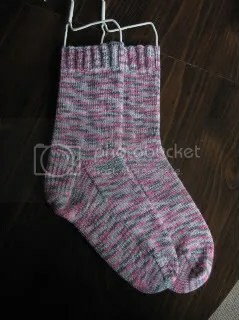 I love to knit socks. They are the perfect project for me. Small and portable, easy to put down and pick up. Along with this love of all things socks comes a love of sock yarn. If there was a knitters crack it would be sock yarn. There are so many many to chose from. Buying just one or two skeins won’t break the bank. There are even online yarn shops that specialize in sock yarn. I can’t be the only one who feels the pull to buy and possess yarn for socks. I love hand dyed sock yarn with it’s unexpected color combinations. It is the eye candy of the yarn world. But even with a drawer full of beautiful hand knit socks knit with the most beautiful hand dyed sock yarn I still find myself pulling the same pair of socks off the drying rack first after washing all the hand knit socks. Plain stockinette socks with a heel flap knit with Patons Stretch sock yarn in the color sugar bought at Michael’s on sale as a whim. Isn’t it funny how what we think we love isn’t necessary what proves to be what we love in the end. I guess with socks sometimes it’s all about how they feel on your feet. This week I will be participating in the 2nd annual Knit And Crochet Blog Week so all posts will follow a prescribed topic. If you are interested in reading other blogs that are telling “A Tale of Two Yarns” please search the tag in the title of this post or go here. This entry was posted in 2KCBWDAY1. Bookmark the permalink. I know! I’ve got a certain fondness for my LionBrand SockEase and Paton’s Kroy socks too. The “fancy” sock yarn sometimes just isn’t as nice to your feet as the “cheap” yarn! Love your post for Knit and Crochet Blog Week (which I’m also participating in this year!) Many of the posts mentioned yarns I didn’t know but the Patons that you pointed out is one I do know and love. Great pick!